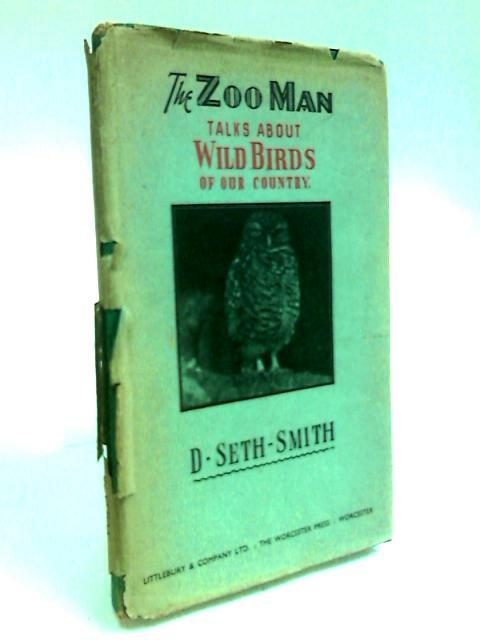 The Zoo Man Talks About the Wild Birds of Our Country by Seth-Smith, David. 111 pages. Blue, pictorial dust jacket over green cloth. Firm binding. Noticeable foxing, tanning and handling marks with dedication to previous owner at front endpaper. Insert of previous owners name at front endpaper with B&W plates. Noticeable bumping, rubbing and scuffing to spine ends and to corners with noticeable rubbing, scuffing and wear along edges and over surfaces. Unclipped jacket with tanning and tearing along spine. Chipping and tears to spine ends and along edges with noticeable rubbing and wear over surfaces.